No matter what I do sometimes my feet are just super dry. We're coming into winter too now, so this is the time to up your pedi care routine. If you have dry, cracked soles read on for my tips to happy feet! Your feet cop a lot since you walk around on them every day. They support your whole body and I know mine do a lot of extra little tasks that not everyone does. I play a bit of soccer now and again, go to the gym regularly and like to go to kickboxing a couple of times a month... Add the dry weather to this and you have a recipe for dry, cracked feet. I get a pedicure once a month; I do my own manicure to save some money. Sometimes when I go to get my pedicure done I ask my pedicurist to give me a pedi-peel. She uses Pedi-Peel Professional which you can actually buy online - I am not sure what is in this however it peels skin off the bottom of your feet immediately. Coupled with a nice moisturiser, this is a great addition to a spa pedicure. So what do I do at home to keep my feet looking great? I use a home foot peeling kit, Burts Bees Coconut Foot Creme, Scholl Pedi Velvet Smooth Electronic Pedicure Foot File and a scrub in between pedicures. I also extend my toe polish by touching it up; however since my pedicurist preps and paints my toenails correctly, my pedicure lasts a month. I am not sure whether this is normal - does yours last that long? 1. Use a Foot Peeling Mask - they have Great Little Socks you Wear! The first step to happy feet all the time is to use a Foot Peeling Mask. A few years ago Milky Foot Exfoliation Pads were all the rage and until I wanted to try a natural alternative that is what I used. For this blog post, I decided to try a Korean natural alternative called The Face Shop Smile Foot Peeling Mask. I bought mine at the World Square Shopping Centre The Face Shop (there is one of these in Sydney, CBD too). I read a product review online and the results seemed to be good so I decided to give it a go. The process is slightly different to the Milky Foot Exfoliation Pads because the Milky Foot socks are already filled with product. Here I am pouring the exfoliation liquid into The Face Shop Smile Foot Peeling Mask - this is a bit of fun I might add. Although there were extra steps I didn't mind because I was trying something new. Once you do up your little boots, you have to sit with your The Face Shop Smile Foot Peeling Mask on for 90 minutes. This is 30 minutes longer than the Milky Foot product. I needed to do work during my 90 minutes, which is good, because I wouldn't recommend walking around in your socks. They are pretty slippery - so maybe you should do this sort of thing whilst watching TV? After the 90 minutes you wash your feet off. The plus of The Face Shop Smile Foot Peeling Mask is that it didn't really take my toe polish off like the Milky Foot did. Your feet feel very cold and fresh after having this on. It is a different feeling to having the Milky Foot product on. After five days my feet begin to flake after the heat of a morning shower. After the fifth day you need to start buffing. The best time to start buffing is after you have been in the shower every morning. You'll need to go through this process for about three days - since you'll be flaking if you use a foot peeling mask. I get out and dry myself and the first thing I do after that is use the Scholl Pedi Velvet Smooth Electronic Pedicure Foot File while my feet are still soft from the shower. You don't want to walk around all flaky do you?! This is all I do in the morning since I am pressed for time. During the peeling process it is best to use a foot cream every evening. After that I tend to use it twice a month, but you can increase that during winter if you are more dry. I use Burts Bees Coconut Foot Creme because it smells so amazing and it is natural. It's pretty sticky but your feet are a lot more soft the next morning. I slather on enough to cover my feet and wear socks over the top at night. This protects your sheets but also means that the foot cream has a chance to soak into your feet. In the morning after you do this, the cream shouldn't be obvious any more and you should be able to take your socks off easily. Please be careful while walking to the shower still though; you never know when you might slip. After using a lip polish for the first time I got a bit obsessed. What other sugar scrubs can I use?! You can scrub your whole body with sugar scrub; however, as I mentioned I have sensitive skin so I steer away from manual exfoliation. My feet love the stuff though. For this blog post I have tried Food2Face Cocoa, Sugar and Lime Body Scrub. It smells amazing; and is natural. Food2Face is a new company based in Sydney, Australia and they make everything they sell daily so their products are really fresh. Their ingredients are as close to real food as you can get - in fact you probably could nearly eat them. Just like real food, Food2Face products have a short shelf life. My Food2Face Cocoa, Sugar and Lime Body Scrub doesn't contain fillers, nasties, synthetics, water, or preservatives (including natural ones) to extend their life. And, of course, Food2Face is not tested on humans. I used this wonderful product to exfoliate my feet the weekend after the foot peel to finish my peeling process. Keep up the foot cream though through the month and you will be laughing! So what's my verdict on a more natural foot peeling product like The Face Shop Smile Foot Peeling Mask? Well it's great that it didn't take my toe polish off, however I felt that it really didn't work as well as the Milky Foot Exfoliation Pads. However, if you are going somewhere and you don't really want to have lizard feet, The Face Shop Smile Foot Peeling Mask is a good product to tide you over. 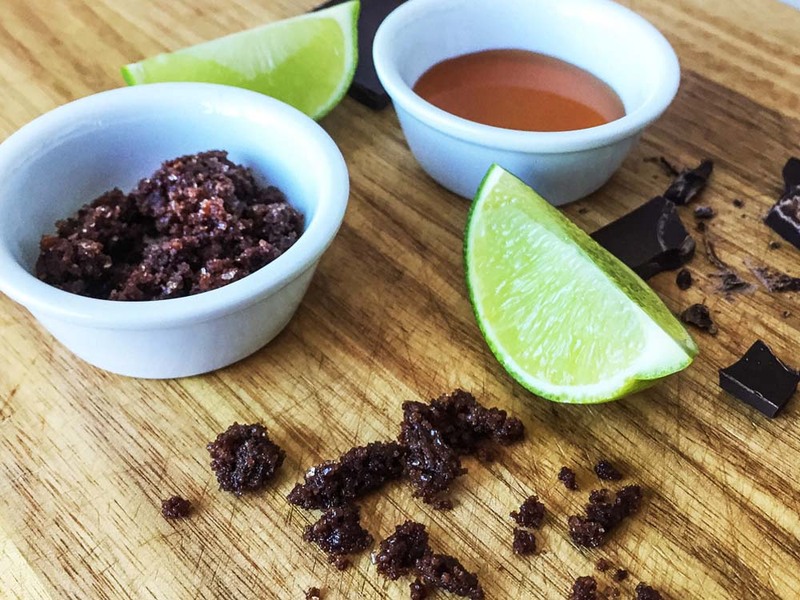 And the Food2Face Cocoa, Sugar and Lime Body Scrub that is so close to real food you can taste it? At the start you might think that this product is a little bit dry, however once you mix it with water and start scrubbing it works wonders. It is just the right balance of sugar to exfoliate and almond oil and lime essential oil to invigorate and leave your feet soft and smooth. Make sure you wash and dry your feet properly before you go walking on tiles though! What do you do to keep your feet looking great? Do you have a favourite foot peel and foot cream? Comment at the end of the post!